For November's Cheese of the Month Frances Sterry, manager of Paxton & Whitfield's Chelsea Green shop, has selected the award-winning German cheese Bavarian Blue (Pasteurised cows’ milk, vegetarian rennet). This delicious, rich and creamy blue cheese with a soft white bloomy rind is made in the Allgau region of Bavaria, in north east Germany. This area of Bavaria has a strong tradition of dairy farming that dates back over 300 years and the unique flavour of the cheese is due, in part, to the rich pastures that the cows graze on. 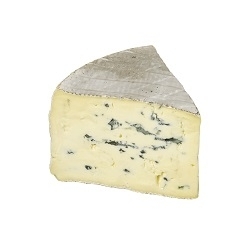 Bavarian Blue is a triple cream soft cheese making it particularly rich and decadent. Through using a cold maturation process, the cheese gradually develops an aromatic spicy flavour whilst maintaining a creamy, buttery consistency. It is traditionally eaten in Bavaria as part of a hearty breakfast or as a snack with bread. It works very well with warm meals such as gratins and in sauces. Bavarian Blue won Super Gold at the World Cheese Awards 2016 and it also won Supreme Champion at the Nantwich 2012 International Cheese Awards.